If you have a thousand dollars you are looking to invest in a standing desk, then you know the importance of buying a long-term quality option. Fortunately, with this budget, you’ll really be able to come away with a desk that combines an elegant look with quality that will last years to come. Here are some of the best standing desks you can find for under $1,000. $1,000 For a Standing Desk? Or Go Less and Add Accessories? With $1,000 to spend you can really get creative here. You may want to go with a standing desk that costs less leaving you money to spend on some important standing desk accessories that really help make a standing desk the ideal experience. The main accessories I highly recommend getting are a monitor arm and a standing desk mat. These two will enhance your standing desk experience so that you’re getting the full potential from your desk. To make things easy for you, if this is something you are considering then the 2 main standing desks I would look at are the Jarvis desk or the Uplift 900. The frames for both of these are around $450 so with a desktop you’ll be looking at anywhere between $500 and $750 total. Right at your budget point if you want to add some accessories. You can see both of these desk frames on my post for a $500 budget. Or, you can just buy a desk at your budget point of a thousand and add these on later. It’s up to you. If you have it in your budget then it may just make sense to spend more and just buy a higher quality desk now so you’ll have fewer issues to deal with. Is It Worth Investing $1,000 On a Standing Desk? For some people, this is going to be a lot of money to invest in a standing desk. The thing is, if you work in an office and spend most of your entire day sitting at a desk, then 1k to drop on a standing desk isn’t a lot of money in the grand scheme of things. Especially since with this budget, you can come away with a desk that will last you for years to come. Anyways, enough with the romance. Let’s get down to business. Here they are, in no particular order. This standing desk is definitely one of the best money can buy, and iMovR’s base model for this desk goes for $999, right at your budget point. And in my opinion, this desk is worth every dollar. This isn’t your typical standing desk made of cheap foreign made parts. It’s entirely American made, from the frame to the 3D laminate desktop. 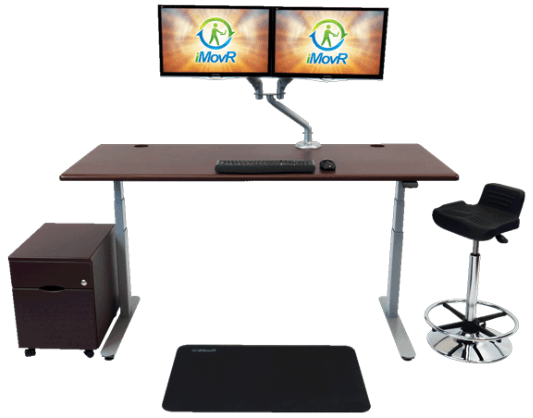 iMovR simply designed every aspect of their standing desks with quality in mind and are built to last. They have other standing desks but this is their top of the line product. In addition to arguably being the best standing desk made on the planet, it also comes set up with an app that you can you use to make sure you are keeping up with your standing goals. So if you want to be reminded to stand up you can set it up to do that for you. If you’re wondering whether the quality on this desk is really worth dropping 1k on, then their 10-year warranty on all base components and 5-year warranty on their desktops should give you some reassurance. The UpDesk. This is another one of those desks where the quality of it is just above and beyond what you’re going to get with a cheaper standing desk. It’s really apples and oranges with this and the Lander desk. Both are top of the line products and I assure you that you can’t go wrong with either. This standing desk used to go for well over a grand, but now it’s going for just under $900 making it great for this budget point as you’ll have a bit to spare. The UpDesk is a sleek looking desk and if you’re looking for a desk that simply speaks to the tech community, this is it. I think this is the perfect gamer desk as it comes black, gray, or white for the frame and top. 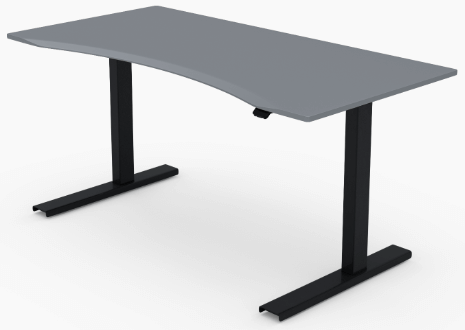 However, in addition to their basic colors designs they also offer the UpDesk Pro UpWrite, designed specifically to unleash creativity as you’re able to write on directly on the desk frame. Unusual? Yes. Interesting. Definitely. This may or may not be a feature you want, but I think for creative-minded individuals this is a feature that you’re going to love. Why am I only listing 2 desks? Well, these are simply my favorite 2 options at this price range. There are plenty of others you can go with as well. Some others you may want to consider would be the GeekDesk v3, the VertDesk v3, the Ergotron WorkFit-D, or the ModDesk Pro by Multitable. All of these options (as well as others I’m forgetting) are good standing desks as well, don’t get me wrong. But after analyzing several factors including manufacturing, warranty length, features, height range, stability, speed, and aesthetics I believe these are the best standing desks you can find at this budget point. With a thousand dollar budget you now have the ability to get the best standing desks money can buy. You don’t have to sacrifice quality at all and you can get something that is going to last you a considerable amount of time. This is the main difference that you’re going to notice. Is that after a few years your standing desk will still be working almost the same as it did when you first bought it. These are simply top of the line materials and engineering that you now have at your disposal. What do you think about the options I included here? Is there something that you think should be on the list? Let me know in the comments below.